It is of single chassis construction. At each Bin a radial gate is provided which can be opened in any position to regulate the aggregate flow. Individual endless belts are provided below the gates to discharge material onto the gathering belt. A single-deck vibrating screen is provided on the slinger conveyor to remove oversize aggregate received from the 4-bin feeder. 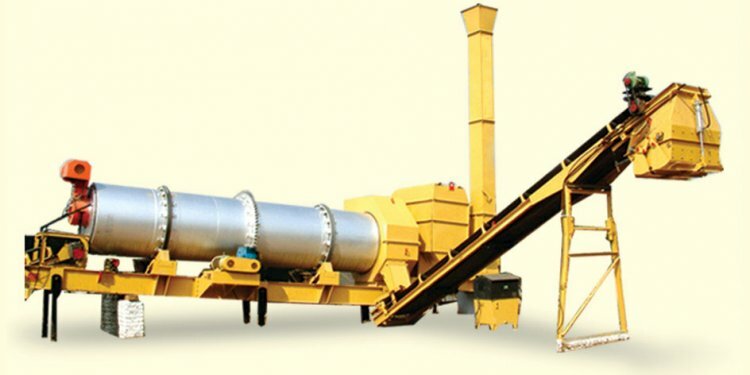 An inclined conveyor mounted on idlers receives aggregate from the gathering conveyor and feeds it to the dryer. The dryer is accurately fabricated to ensure proper heating of aggregates with minimum heat loss. Specially designed flights lift and cascade the aggregate to reduce the final moisture content to 0.5% (by weight). It is supported on steel rollers through steel tyres with idlers and guide rollers and is provided with segmented driving sprocket. A fully automatic high-pressure auto jet burner is mounted at one end of the drum. The discharge chute design discharges heated aggregate directly onto the loadout conveyor. One/Two Bitumen Tanks of 15/20 MT. capacity each are provided, fabricated from steel plates with 50 mm glasswool insulation, manhole, thermocouples, etc. Bitumen is pumped to the dryer drum through pipe lines. Tanks are fitted with independent on-off type burners. The dust collection system consists of enclosed multiple cyclones, exhaust fan and chimney. Mixed aggregate from the dryer drum is discharged on an inclined conveyor provided with a hydraulic hopper at delivery end for feeding the Mix into Tippers. Fabricated from steel plates, it feeds the required quantity of mineral to the drum. A fully automatic control panel with feather touch controls is provided for controlling the quantity and quality of production with operator sitting in Air-conditioned comfort. All systems are completely synchronized with automatic / manual control of burners, load cells, mix temperature, cold feed / mineral / bitumen proportions, etc. Manual control is possible through over-ride system. Adequate safety measures are adopted to avoid overloading, short-circuit, etc.